UNESCO chief confirms she received Israel's letter of withdrawal from the organization. Israel will leave on December 31, 2018. 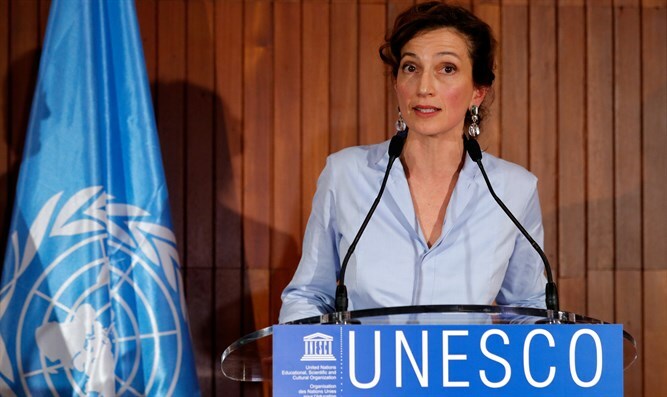 Audrey Azoulay, the Director General of the UN’s culture and education organization UNESCO, confirmed on Friday that Israel has formally notified the body of its withdrawal from the organization. In a statement quoted by AFP, Azoulay, UNESCO’s first Jewish head, said she had been officially notified that Israel would leave on December 31, 2018. "I regret this deeply, as it is my conviction that it is inside UNESCO and not outside it that states can best seek to overcome differences in the organization's fields of competence," she said. Prime Minister Binyamin Netanyahu last Friday instructed Carmel Shama Hacohen, Israel’s Ambassador to UNESCO, to officially submit a letter of withdrawal from the organization. While initially it looked as though Israel had missed the deadline to withdraw from the body in 2018, Shama Hacohen was able to submit the letter of withdrawal on Thursday. The October 12 announcement by the United States that it was pulling out of the organization followed two Arab-sponsored resolutions adopted by UNESCO this year which were critical of Israel. One referred to the Jewish state as "the occupying power" in Jerusalem. Another declared the Old City of Hevron as a “Palestinian World Heritage site”. Last year, UNESCO passed resolutions declaring that Israel has no rights to Jerusalem, and described the Temple Mount and Old City of Jerusalem as Muslim holy sites.